Studies have shown that most consumers judge the quality of an organization simply on the quality of their signs. Therefore, prioritizing advertising resources on banners is important to generate positive awareness as well as avoid a negative perception. 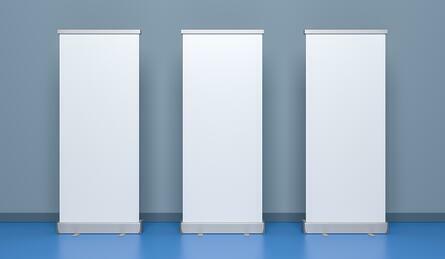 If you have been using banners for years but find the results to be lacking, changing your approach may be necessary. Here are some tips and strategies to employ with your Christmas display banner stand. The most important element of a sign is the message. Your company or organization should select text that speaks to the product or event in a manner that sets it above the competition. How this message will best be tailored depends on the placement and target of your advertising campaign. Keep in mind that drivers have just a few seconds to absorb and process your banner’s message. To maximize the impact of your sign keep the copy as simple as possible while still explaining what you offers sufficiently for people to find you later on. Use font and background colors that create a stark contrast and draw the eye towards the banner. Signs aimed at pedestrians, whether they are in a mall, shopping district, fairground, or convention, have more time to make an impression. The copy should still be easily relatable and informative to the reader, but can go into greater detail. The color contrast should still be dynamic with eye-catching text colors like red, white, and black. The message and placement of your sign is meaningless if it does not have an engaging appearance. Arm yourself with knowledge about the banner fabric industry to ensure that the banner promoting your business or civic organization looks great, and source your banner materials from trustworthy suppliers. The majority of banner fabric is considered “screen grade.” This means the fabric was designed with ink screen printers in mind. Material such as Herculite Bantex is designed for modern roll-to-roll digital inkjet printers. While premium materials may cost slightly more up front, the return on investment is significantly greater. Because of its higher rigidity, premium banner fabric is specifically designed for digital grade printers. Premium fabric avoids many of the issues that “soft hand” materials face when used with a digital printer. These problems include wrinkling, head strikes from poor feeding, and tracking issues. To control or eliminate dot gain, many premium fabrics feature a textured surface. Dot gain can lead to a darker appearance than intended. High quality digital grade banner fabric can be used with any printer type, including solvent, eco-solvent, UV Curable, and latex inkjet. Even the highest quality banner material eventually needs to be replaced. When a sign looks tattered or worn, it reflects poorly on your business or civic organization. Regularly inspecting your banner for any wear and tear is important. If you are diligent about these inspections, you’ll catch small problems before they become unsightly embarrassments. Regularly cleaning your Christmas banner is another way to keep it looking great after repeated use. When cleaning your banner, use warm water and mild dish detergent to remove any dirt or debris. Less is more when it comes to cleaning banner material – instead of dousing it with water, spot clean and use fabric washcloths instead of residue-leaving paper products.